What if You Don’t Have Clients to Spread the Word Yet? When I ask others about their advertising strategies, I always hear a lot of the same great advice. Typically, other tutors reference the importance of word of mouth and I completely agree! The majority of my regular clients have come from great referrals, but what do you do if you don't have clients to spread the word yet? The problem I encountered was not knowing how to get those initial clients so that word of mouth could spread. I moved from Virginia to South Carolina, I didn't know anyone, and I wanted to start my own tutoring business. I thought there might be a few of you out there trying to do the same thing, so in this post I'm going to share a few of the strategies I have used to find new clients. I'm being selective though. I don't want to waste your time with all of the strategies I tried that didn't work. I am specifically selecting the strategies that clients have shared with me as their reason for contacting me. When Selecting the name of my business, a few friends and I sat around brainstorming ideas. We endend up selecting Math Ninja: Master Math by Attacking Problems. The reason I share this with you is that it has been grabbing people's attention no matter the advertising venue. I've had customers tell me they called me because my name stood out from the crowd and was memorable. I have watched others as they encounter my advertising material and they will point it out to their friends. What I'm trying to say is if I had chosen to use my personal name or location as the name of my business, my business wouldn't get nearly the attention it gets now. Okay, I wish it were that easy! Of course it isn't. Most businesses now a days have a website so how will you make sure your website is the one they see? People tend to only look at the first two pages of search results. If you have competition when you first start out, your business will, more than likely, not be on those pages. List your business with all major search engines (Google, Yahoo, etc.). List your business with websites that list services in your area (Angie's List, Craigslist, Yelp, foursquare, etc.). Many of these sites have already built a reputation and will show your information in search results before your website will pop up. Write blog posts that incorporate the search words people use when searching for a business like yours. Write guest posts on other sites that link back to your site. Take a look, I'm doing it now! Use an SEO plugin for your website. I'm sure you have heard of SEO (Search Engine Optimization). It plays a huge part in helping others find your website. Of course you can always buy advertising with Google to be the first business future clients see, but I haven't spent the money on this strategy yet. I'm hoping to be on page 1 by the end of my second year using other strategies. Wish me luck! Tell Everyone You Know – Seriously, do it. Share any positive things you can with family and friends as often as possible. They know people who may need a tutor. Computer Decal – I created a decal using decalgirl, and I am constantly getting people to comment on my business name or ask for a business card while I'm working on my laptop at the library, coffee shop, waiting for my car to get fixed, etc. Door Magnet – I created a door magnet for each side of my car using vistaprint. People knock on my windows for more information when I'm sitting in parking lots. Kids and adults will point at the magnet and chat about my business. I've even received calls from people in my neighborhood saying they have seen me and can I help their child. Business Cards – Anytime I meet someone new I work hard to bring my business up naturally in conversation. I use my business card to exchange information even if they don't need a tutor. You never know, they might have a neighbor or colleague that mentions needing a tutor and they will have my card. Suprisingly, this happens more often than you think it might. People genuinly want to help others and if they know about you and like you, they will want to tell their friends about you. Flyers – I created flyers with pull tabs and posted them everywhere I could (coffee shops, restaurants, college bulletin boards, etc.). Email – Introduce yourself to teachers and administrators at local schools. Let them know you want to help and that you would appreciate it if they keep you in mind when parents ask for tutors. Social Media – Share valuable information that others will want to share with their friends. I have to admit, this is not easy. The types of content that gets the most shares for me have been personal celebrations and contest results. I hope my experiences as I build my tutoring business can help you with yours! I'd love to learn from you too! Leave me a comment with any strategies that have been successful for you. I can't wait to hear about them! Are you looking for additional ideas? 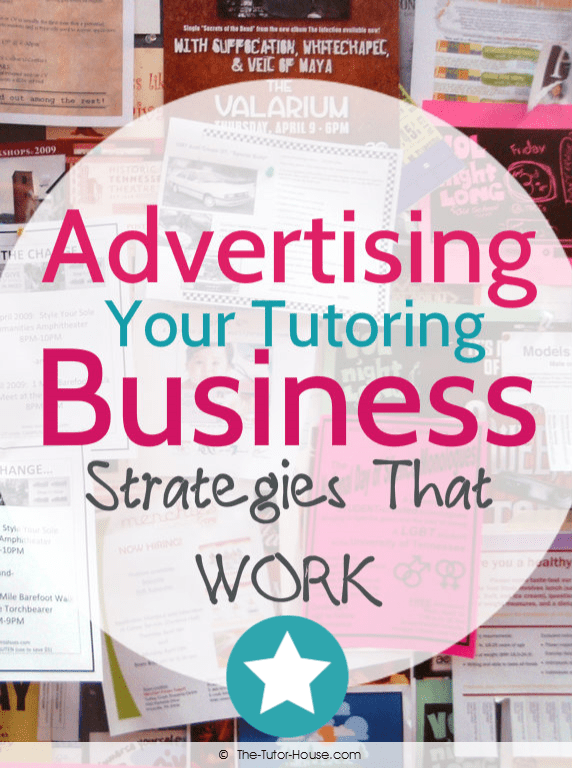 Check out 35 Ideas to Market Your Tutoring Business. I'm sure Adrianne has a lot of helpful tips. Does having your website pop up in a “search” cost money? Nope! There are little things you could do to help your site show up in search results. One of which Angela has demonstrated above which is to link in with a site that ranks higher than yours. By Angela writing good content about tutoring on my site, this helps signal to Google SEO robots that quality content about tutoring is being written here. Which then links to you and gives you more validity. Another tip I could recommend is that when you upload a picture to your website, give an SEO friendly file name. Instead of letting it be DSC9449 or whatever file name, name it something that pertains to the topic that page is about. This helps the Google robots determine what your site is really about. Maybe I should write a post about this! Definitely favoriting this site! thank you so much! So glad you like it Gabby! Thanks for coming by.